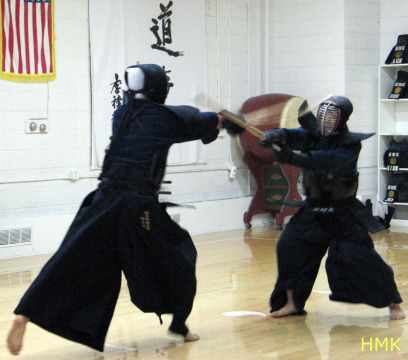 As you know, the most basic piece of equipment is the bamboo sword in kendo. The kendo stick called shinai. Shinai is constructed of four shafts of split bamboo, bound with a leather grip and cap, and leather thong wound three times around the shafts, all tied together by a nylon chord (back string; tsuru) running from tip to hilt. Additionally, a round hand guard is slipped over the grip and held in place by a rubber holder. The tip of the shinai is referred to as the kensen(sword tip). The striking surface of the shinai, called monouchi(valid part), is the first one third of the shinai visible from the grip (tsuka) to kensen. When striking a target you must strike with this portion of the shinai in order for the strike to be considered valid. What makes a good shinai? The most important thing is that it is both strong and flexible. If you put the tip of a shinai on the floor and try to bend it, then it should bend about a third of the way from the tip (around the leather thong), at the place you use to strike your opponent. You should be able to feel it pushing back. A weak shinai will bend around the guard. The point at which the shinai bends is the point where it releases power when you strike. When you strike with a weak shinai it will bend like a stick from the guard to the tip and then whip back more powerfully than the armor can protect. It can also pierce the mask-grill and hurt your opponent and may cause you to hurt your own wrists and elbows. These are the current International Kendo Federation (FIK) regulations for the shinai. Shinai is weighed complete, but without guard (tsuba) and guard holder (tsuba dome).Maximum diameter of guard is 9cm. The above is a picture of a special bamboo sword that is used to practice the swing to build power. It consists of 6 or 8 shafts of split bamboo. This is much bigger and heavier than standard shinai. Here is a scary story that people have lost their sight and even their life when a cracked piece of bamboo pierced their eyes. Please don’t make another bad and sad story.All you need to do is start off with a well shaped shinai and look after it carefully. Proper care must be given the shinai to ensure the safety of your kendo player. The leather grip (tsukagawa) should not be loose and sliding around. The leather thong (nakayui), likewise, should not be loose and sliding up or down the shaft of the shinai. 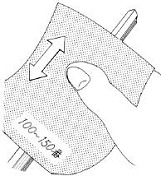 Make sure that the leather cap (sakigawa) is not torn or coming apart. Most importantly, make sure that there are no splinters or cracks in the bamboo. Large cracks or breaks will necessitate replacing the broken slat or replacing the shinai entirely. When you have some splinters or a small split, disassemble the shinai completely first. Scrape the splinters off with firm strokes from the bottom using a knife. If you dig from the top down the blade may dig into the bamboo. Next use some sand paper to smooth the surface. Make sure you round out each piece of the shinai well, and then afterwards finalize the process by oiling the shinai or putting a little wax. There is special oil available from kendo equipment vendors, but a light vegetable oil will suffice. Note: If the bamboo actually splits (with or against the grain) you should stop using it. It is dangerous to tape it up and keep using it. It is manner in kendo to make sure that you carry the shinai inside a specialized bag. 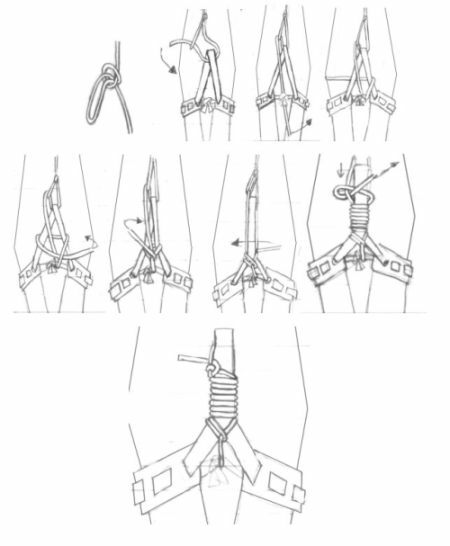 Most bags can hold from 1 to 3 swords. Some have a shoulder strap. Bags can be made from many materials such as cotton, leather, or silk, etc. They come in many colors and designs or you can make your own! Just make sure you don't carry around the shinai naked... let us at least maintain the foundations of kendo manner. (1) Loosen or untie the leather thong. (3) Pull the leather tip off with one hand, while holding the bamboo slats together with the other to keep the rubber tip in place. (4) Take off the Leather Hilt. 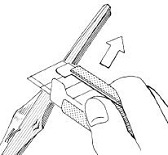 Scrape the splinters off with firm strokes from the hilt towards the tip, using a knife,file or a fixing tool. If you scrape from tip to hilt, the blade may dig into the bamboo. Next use some sandpaper to smooth the surface. Finally rub in a little wax, Vaseline or vegetable oil. If the shinai cord is broken, you should replace it. When you need to replace the cord, you should know how to tie the cord as shown below. (1) Pass the cord through the `leather loop' on the hilt; Thread it back through the komono. (2) Pass it under the knot in the hilt's leather loop and pull it tight. (3) Pull the cord tight with your right hand while you hold the komono down with the left. (4) Wrap it round the loop. Tie it once. (5) Wrap it round the loop. Tie it once. 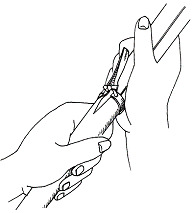 (6) Finally, use an awl to make a space between the two branches of the loop and pass the cord through. Thread it under the cord and cross it back. Thread under the cord from the other side. Loop it round and under the last loop. Again loop it round the cord, cross over and pass it under the last loop. Repeat this once more, then cut off any excess leather. The wooden sword used in prearranged sword forms such as kendo kata practice or others. It is called bokuto or bokken which means wooden sword. Like the shinai it should be treated with respect. In addition, because it is made of solid wood it can be dangerous if not handled properly. Never swing the bokken at another person for "fun". The tip of the bokken is also called kensen [A]. It has a grip (tsuka)[B], guard (tsuba) [C] and guard holder (tsuba dome). The proper striking portion is also referred to as monouchi (valid part)[D]. The ridge lines running the length of the sides of the sword are called shinogi [E]. The bokken is used in prearranged forms practice (kendo kata) that employ parry and deflection techniques using the shinogi. 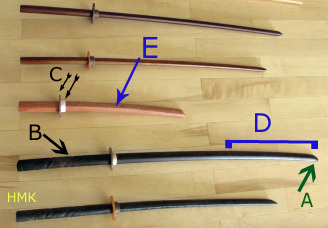 In the below first and second photographs show special types of bokken called suburito(sword for swing practice) used primarily for suburi(swing). They are bigger, heavier and lack a tsuba. The third and fourth are the standard set used in kendo kata and represent the long and short swords carried by samurai. If you want to keep the bokken clean, rub oil on the body of the sword, not the handle, from time to time.